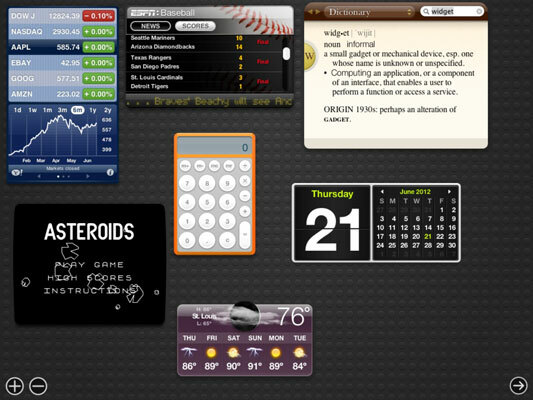 MacBook’s Dashboard allows you to display and use widgets with the press of a button. Widgets are small applications — dubbed by some as “applets” — that typically provide only one function. For example, Dashboard comes complete with a calculator, dictionary, clock, weather display, and quick-and-simple calendar. You can display and use these widgets at any time by pressing the Dashboard key; by default, that’s F4 on current Apple keyboard models, but you can modify the key on the Mission Control pane in System Preferences. Dashboard appears as a desktop in the Spaces strip on the Mission Control screen, an icon in the Dock, and as an icon in Launchpad. Press the Dashboard key, and the widgets appear, ready for you to use. You can add widgets to your Dashboard by clicking the Add button (which bears a plus sign, naturally) at the lower-left corner of the Dashboard screen. Then, Dashboard displays your entire collection of widgets, and you can click a widget to add it directly to your Dashboard. It’s also easy to rearrange the widgets that are already populating Dashboard by dragging them to the desired spot. After you finish customizing your Dashboard display, click the Dashboard background to return to your Dashboard. When it’s time to go back to work (or play), press the Dashboard key again to return to your Mountain Lion desktop, or click the right-arrow button at the lower right of the screen. If you need to use a widget for only a second or two, press and hold down the Dashboard key. When you release the key, you’re back to your desktop. Most widgets have an information icon (look for a tiny circle with a lowercase letter i). This icon allows you to change things, such as borders, zip codes, and display columns. Click this information icon, and you can tweak whatever options are available for that widget. To remove a widget from the Dashboard display, just click the Delete button and you’ll notice a tiny X button appears next to each widget on your Dashboard. Click the X button next to the widget you want to remove, and it vanishes from the display. Deleting a widget doesn’t remove it from your Mac entirely! You can add that deleted widget back again by clicking the Add button. You can modify the Dashboard key by turning it into a key sequence, trackpad gesture, or mouse button action, which is A Good Thing if you’re already using an application that thrives on F4. Visit the Mission Control pane in System Preferences, and use the Shift, Control, Option, and cmd keys with the Dashboard key to specify a modifier, or choose a gesture or mouse button to activate the Dashboard. Run Safari and navigate to the site you want to view as a widget. Select the portion of the page you want to include in your widget and then click Add. Some web pages use frames to organize and separate sections of a page, so this step allows you to choose the frame with the desired content. Drag the handles at the edges of the selection border to resize your widget frame and then click Add. Bam! Mountain Lion displays your new WebClip widget in Dashboard. If you click a link in a WebClip widget, Dashboard loads the full web page in Safari, so you can even use WebClips for surfing the sites you visit often.